So my last post showed three different versions of the local quilt store BOM for 2010-2011. (Remember that I still have to finish the fall one!) But since that one is finished we’ve already started the new one. This year’s colorways are Red/Black/White and Blue/Green/Yellow. They are beautiful! 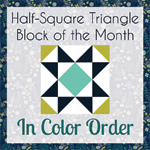 Again the blocks and finishing pattern are based on Marti Mitchell’s templates. I recently gave a set of the templates to my stepmom, and she loves them. I’m not sure that I would be the quilter that I am without these templates. I can’t praise them enough. I usually do my own version and pick out my own colors so that I can use up some of the scraps in my stash, but I’m having a hard time deciding what I want to do this year. My mother suggested a blue and white Christmas version of this quilt. I may do that, but I should decide soon so that I can get caught up.